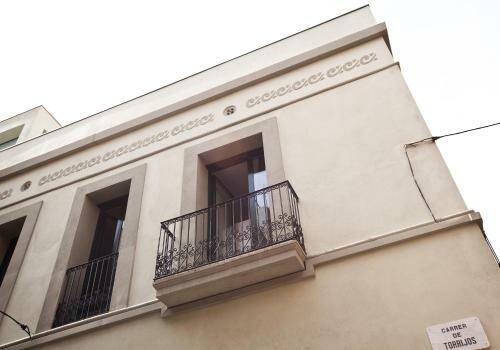 Set in Barcelona’s trendy Gracia district, a 5-minute walk from Joanic Metro Station, Cool Gracia Apartments offer free WiFi and air conditioning. There is a communal roof terrace and chill out area. These modern air-conditioned apartments offer a living room with a flat-screen TV and sofa bed, dining area and a balcony. A fridge, microwave, coffee maker and kettle can be found in the kitchen. The bathroom comes with a shower and hairdryer. There is a supermarket within 200 metres, as well as many shops, bars and restaurants within a 5-minute walk. Plaza Catalunya is 10 minutes away by Metro and Passeig de Gracia with its famous Gaudi monuments and designer shops is a 15-minute walk. Please note that check-ins outside the normal reception opening times are subject to a surcharge. € 25 for check-in after 20.00. € 40 for check-in after 23.00. This apartment features a private terrace. It has 2 bedrooms, 1 with a double bed and a single bed and 1 with a bunk bed. The living room features a sofa bed and a flat-screen TV. A microwave, fridge, coffee machine, kettle and kitchenware can be found in the kitchen area. The bathroom comes with a shower and hairdryer. Bedding and towels are provided free of charge. This apartment has 2 bedrooms, 1 with a double bed and 1 with a bunk bed. The living room features a sofa bed and a flat-screen TV. A microwave, fridge, coffee machine, kettle and kitchenware can be found in the kitchen area. The bathroom comes with a shower and hairdryer. Bedding and towels are provided free of charge. Rate: € 152.95 ... € 316.48; select dates below to get current rates.